Any other girl bosses out there? Raise your hands if that's you! Girl bosses or not, I think it's fair to say that we all lead pretty hectic lifestyles. When we're not at work, we're running our homes, taking care of our families and indeed some of us are even running side earner businesses such as blogs. According to the HSE, 12.5 million working days were lost in 2016 and 2017 due to work-related stress, depression or anxiety. Needless to say, the statistics speak for themselves. Stress has become a massive issue across the UK and is to blame for many of our health problems. One way we can combat this is to ensure we take time out of each and every day to simply relax. This is obviously easier said then done but having much needed 'me time' is vital if we all want to remain both physically and mentally healthy. If you're someone who struggles to switch off, then try escaping to the bathroom in an evening for just an hour or so whilst you indulge in a gorgeous warm bubble bath. If bubbles aren't your thing then you can use essential oils instead. Choose scents that have a relaxing or calming effect such as Lavender, Chamomile or Ylang Ylang. Light candles and place them around the bathroom to create a soft ambient glow. You don't have to plump for the most expensive versions either. If you're on a shoestring budget then opt for bog standard tea lights which will have the same effect. I've mentioned this before in many of my interiors posts, neutral colours are known for creating a calming vibe. 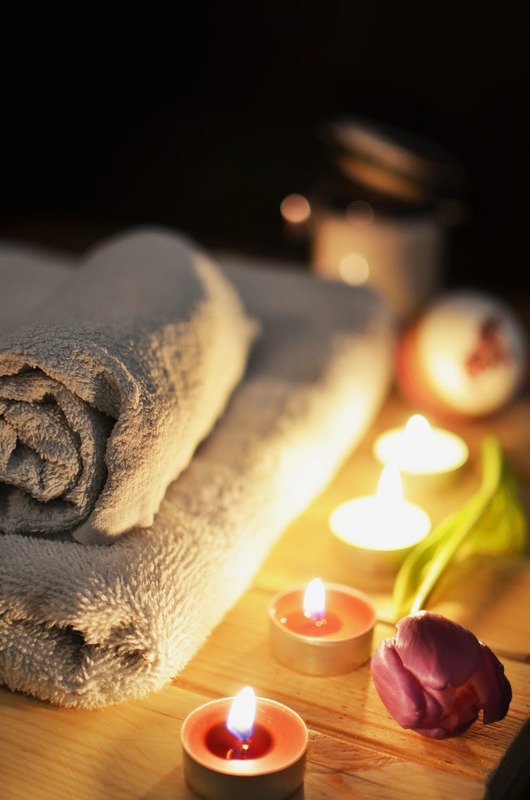 If you step into many spa establishments you'll notice that they too make clever use of lighting, soft music and neutral coloured decor because it gives off a more tranquil vibe. This is the exact kind of atmosphere that you'll be wanting to recreate at home. Definitely avoid bright, garish colours as this will have the opposite effect. Studies have shown that there is a link between stress reduction and nature so plants and greenery are an ideal addition to any home including the bathroom. Not only do they look the part but they can also remove a percentage of carbon dioxide from the air. Minimalism is key as clutter can make a person feel even more stressed so remove anything from your bathroom that you don't need before you settle down to relax. This includes putting away any un-necessary toiletries, towels or indeed any paraphernalia that has crept it's way in. If after a spruce up your bathroom is still hardly reminiscent of a luxury spa, you might want to consider giving it a new lease of life with a makeover. Clever use of interior design and decor can really help to transform an otherwise ordinary bathroom. These days all you need to do is peruse the net and you'll find various offers on brand new bathrooms. If you also check out the fitted furniture at Bathroom City you'll find various elegant looking pieces such as vanity units, wall cabinets, bath panels and storage worktops. I'd also personally add a gorgeous fluffy rug because I think they give a cosy but chic finish to any room of the house. If you have a waterproof radio or gadget that you can use to safely play music whilst bathing or showering then take advantage of this. Depending on your personal preference you might opt for soft dulcet tones or you might prefer sounds of nature. Choose whichever makes you feel calmer and more at peace. Don't forget, the idea is to create a tranquil setting so save the R&B or pop music for another time and place. Lastly, an absolute must whenever I'm relaxing is a glass of wine. If you really wanted to push the boat out then you could treat yourself to some champagne. (Or do as I do and buy the fizzy fake stuff instead! Much cheaper and still tastes okay!) Don't forget to turn off your phone before you lie back and finally relax. Enjoy!